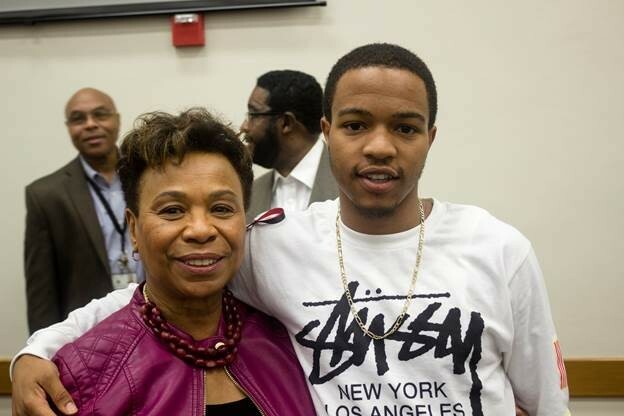 Congresswoman Barbara Lee and Roderick "Travon" Godfrey. One year ago today, I held a gun violence town hall in West Oakland, featuring young activists from the East Bay. At that town hall, I had the honor of meeting 19-year-old Roderick “Travon” Godfrey, an Oakland native, painfully impacted by the violence in his community. Travon captured the hearts of all those who attended. He gave an emotional speech, at times fighting back tears, describing the toll of gun violence in his life. In 2015 alone, Travon lost eight friends to gun violence. He called it the worse year of his life. His words still ring in my heart. On November 28, 2016, Travon and his lifelong friend Deante Miller were shot and killed in broad daylight. This heartbreaking story is all too familiar in communities across the country. This violence has left too many families reeling from the tragic death of a loved one and too many mothers devastated by the anguish of burying a child. More than 30,000 Americans lose their lives to gun violence each year. Shootings now kill as many Americans as car accidents. In Oakland, there were 82 gun violence homicides last year. And already this year, there have been two. For too long, Republicans in Congress have allowed this senseless violence to devastate our communities. That’s why I joined Congressman John Lewis and our Democratic colleagues for a sit-in on the House Floor last year. For more than 24 hours, we shut down congressional action to insist that Republicans do something to address this epidemic. Sadly, Republicans chose to ignore the 80 percent of Americans that support common sense gun reforms. They even tried to stifle our dissent. Rather than holding a vote, Republicans muted the microphones and turned off the cameras. In the face of human suffering, they turned their back on millions of Americans and went on vacation. This year, they’ve continued their attacks by instituting rules to punish members who live-stream events from the chamber floor. Lawmakers who are willing to trade the safety of our communities for cash from the gun lobby do not deserve the honor of serving in Congress. That is why, we must continue to hold our elected officials accountable and demand support from our family and friends around the country for sensible gun reform. As a community, we must register to vote and support public safety measures like proposition 63 when they’re placed on the ballot because no child should ever fear being gunned down while they walk to school. No parent should worry for their family’s safety when visiting the park or attending the movies. No American should have to weigh the risks of gun violence in their classroom or their office or their favorite club. Know that my Democratic colleagues and I are committed to ensuring your voices are heard in the halls of Congress. I will continue to fight in Washington to pass common sense gun reform, because we know that this simple action will save lives. We need universal background checks. We need an assault weapons ban. And we need to be able to address gun violence as a public health epidemic. We also need greater investments in our community like job training programs and better schools. As a member of the Appropriations Committee, I will also fight to protect funding for programs that keep our streets safe and help foster more trust between our communities and law enforcement. We must keep fighting. We owe it to Travon and the countless others we’ve lost in this epidemic of violence.